And on the other side we have Muslims who are offended by the influence and intrusion of the Western world on Middle Eastern culture. They share none of the Postmodernists’ fuzzy thinking on tolerance and multiculturalism, but are happy to open old wounds and play the victim. 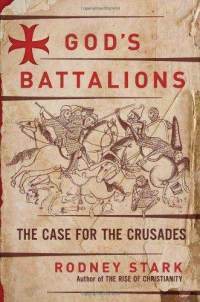 In God’s Battalions (2009), Rodney Stark aims to dispel these myths with good old fashioned research. This is not a complete whitewashing of the enterprise. Stark does not attempt to justify the Crusades on Biblical grounds (and rightly so). Nor does he sugarcoat the fact that Medieval warfare was waged with unremitting brutality. Under this regime, a military leader would spare the inhabitants of a fortified city if its defenders promptly surrendered and opened the gates. If they failed to yield, and the city fell after a long, bloody siege, the inhabitants would be massacred. Those were the usual rules, and the rules were often broken. Civilians and prisoners of war could be killed or enslaved, even after a surrender. Sadly, this was true on both sides of the conflict. Muslims were the aggressors. They swarmed out of the Arabian peninsula and quickly occupied Syria, Palestine, Egypt, North Africa and many parts of the Mediterranean basin. Finally, in 1095, Pope Urban II answered the Byzantine emperor’s plea for help, leading to the 1st Crusade. Muslim rulers were not always tolerant toward people of other faiths. Although Christians were free to worship unhindered at times, persecutions could occur on a large scale. For instance, over 30,000 church buildings were burned or pillaged under al-Hākim, the Fatimid ruler of Egypt. Crusaders were not land-hungry nobles. In modern retail parlance, their castles and strongholds were expensive “loss leaders.” The impoverished lands of the surrounding countryside could hardly support the local Crusader garrisons, let alone enrich the coffers back home. The Crusaders did not force their faith on lands recovered from Muslim invaders. Medieval Europeans were not backward compared to their Middle Eastern opponents. As Stark shows here and in more detail elsewhere (especially chapter 2 in For the Glory of God), Westerners were ahead in many respects (e.g., in their use of the wheel). A number of famous scholars and scientists with Arabic names working in Muslim-controlled territories were neither Arabic nor Muslim. The sack of Constantinople in 1204 was not motivated entirely by greed. The history of the Crusades is, in part, a history of Byzantine duplicity. Emperors frequently reneged on their promise to provide financial and military aid and, on occasion, would align themselves with Muslim rulers against Crusader forces. The attack on Constantinople and the installation of a Latin ruler were defensive moves on the Crusaders’ part. It is easier to get “the big picture” when we have a detailed chronology of events in front of us. Those chronologies are hard to find. Although Battalions is certainly not the only source of information on this subject, the book gets us part of the way by providing a treasure trove of facts and figures. I have taken the next step in organizing this information into a handy table (link below, but please read my caveats). The chronology is remarkable for what it shows. It highlights, for instance, the centuries-long collapse of Byzantine rule, hastened by Muslim conquests. In the preceding six centuries, Christianity had spread peacefully along the eastern and southern shores of the Mediterranean, into Egypt, far down the Nile, deep into Persia (now Iraq and Iran), and into much of the Anatolian peninsula (now Turkey). Sadly, the church in these regions experienced only a brief respite between Roman persecution and Muslim oppression. But the chronology also shows the determination of those who were willing to help. Today, Christians are facing persecution in many parts of the world, especially in Muslim-majority areas. There is still a need for peaceful and prayerful support of these suffering saints. From where will that help come today? In several places I found minor factual differences between Stark and other writers. On those occasions I inserted a “?” and provided a possible correction from relevant sources. In several places Stark did not offer a date for a particular event. On those occasions I have provided a date from other sources. There are sporadic uses of extended Latin characters in the table. If you see “junk” characters, I recommend you set your browser’s encoding page to something other than Unicode (UTF-8). © 2010 – 2013, Trevor Major. All rights reserved. This entry was posted on Saturday, August 28th, 2010 at 11:53 pm. You can follow any responses to this entry through the RSS 2.0 feed. Both comments and pings are currently closed.